Top notes of Neroli from Grasse blend into the sensual, floral notes of two exceptional raw materials: May Rose and Jasmine from Grasse. Aldehydes provide airy freshness and lend an abstract effect to the fragrance. The Parfum comes in a spray for a delicate and feminine application. Gabrielle Chanel's advice was to apply it "wherever you would like to be kissed." Neck, wrist, décolleté ..." To revive the notes of the fragrance throughout the day, the refillable spray slips easily into your purse for on-the-go use. This sleek black lacquer refillable spray is a modern version of the original No5 purse spray, and goes anywhere in a flacon every bit as elegant and sophisticated as the fragrance itself - and as the woman who wears it. To refill, twist open to expose the atomizer. Pull up on the atomizer top to remove the empty fragrance canister. Slide a new canister into the case and twist down the top to close. chanel n°5 parfum refillable purse spray 0.25 oz. 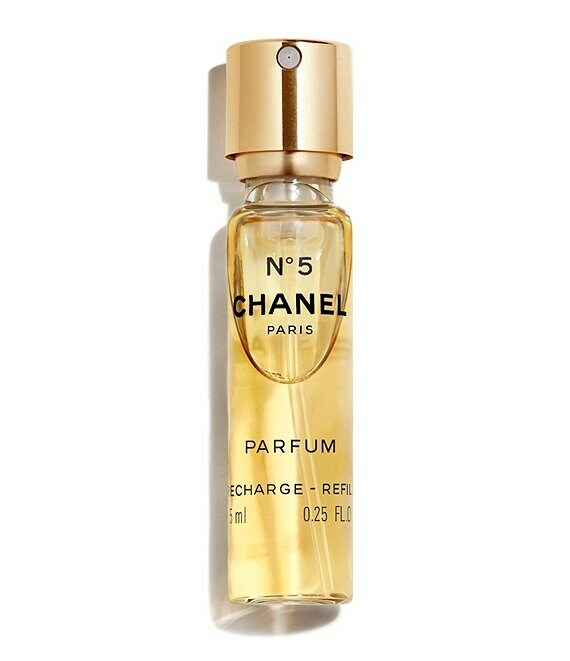 chanel n°5 refill parfum purse spray 0.25 oz.